In his latest feature documentary, Oscar-winning filmmaker Kevin Macdonald (One Day In September, The Last King Of Scotland) has unfettered access to world-renowned contemporary artist, Cai Guo-Qiang. Cai’s work spans East and West, human and cosmic, the playful and the profound. His signature gunpowder paintings pay homage to the Chinese roots of the explosive medium, while incorporating elements of chance and unpredictability. His massive explosion events actively engage audiences around the globe—from his seminal 1993 work that extended the Great Wall of China with six miles of gunpowder fuse; to the daytime colored fireworks that ripped through the deserts of Doha, to the astonishing opening and closing ceremonies of the 2008 Beijing Olympics. Told through the artist’s own words and those of family, friends, colleagues, and critics, Sky Ladder: The Art Of Cai Guo-Qiang traces Cai’s meteoric rise from childhood in Mao’s China to pre-eminent global artist. We witness as Cai struggles with how to affect social change through art, and navigate the compromises and complexities that arise when you’ve made it to the top. When you’ve gone as far as he has, how do you challenge yourself? If you’re Cai Guo-Qiang, you continue to chase the ambitious dream that has eluded you for 20 years—Sky Ladder—a 1,650 foot ladder of fire climbing into the skies, connecting heaven and earth. 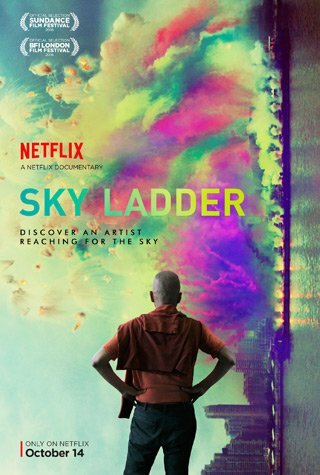 Sky Ladder: The Art Of Cai Guo-Qiang is the story of a unique artist at a pivotal moment in his life and times. Produced by Oscar-winner Fisher Stevens (THE COVE), Wendi Murdoch, and Hugo Shong.